When we were visiting London last year, we passed by the shop Joules at Waterloo Station. The shop wasn’t open yet (still in “coming soon” mode), but I peered through the window (the French call it “lècher la vitrine” or window shopping, actually the literal translation of “window licking,” which was what I was nearly doing) and was absolutely charmed. Their women’s and children’s lines were gorgeous, lots of sweet patterns and lovely designs. 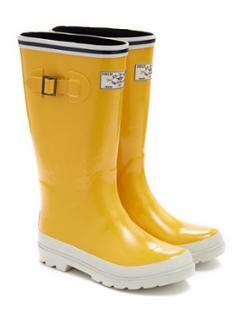 Wellies in primary colors. Whimsical and easy to wear basics. A couple of weeks ago, the Joules catalog came in the post and I was delighted that they are now shipping to the U.S. ($9.95 for standard shipping, $19.95 for express shipping). Prices are a bit high ($120 for a cardigan, come on …) but good quality pieces and they do also have an outlet section, where they house all of their sale items. Here are just a few items I have my eye on. Have you shopped at Joules? Posted on 3, June 2014, in British, Clothing and tagged British, Clothing, Joules, online shopping, retail. Bookmark the permalink. Leave a comment.